Two papers caught my eye recently that have taken advantage of the proliferation of whole genome sequencing techniques in recent years. With prices of sequencing whole genomes coming down and down, biologists are having access to vast amounts of data. The 1000 Genomes Project was one of the first to collect the vast amounts of human genome data into a story that told of human population origins. The two papers that I saw recently extend this story. One provides data from nearly 1500 people throughout the entire world to trace the genetic legacies of Ghengis Khan and Alexander the Great. The other delves deeper into the dawn of homo sapiens in Africa, over 300 whole genomes and nearly 1500 genotypes – the African Genome Project. Each paper is a complex report of population genomics – mostly beyond my understanding – but picking through the text you can find nuggets for the non-specialist. The first paper uses information on alleles, mostly known for the gene variants we inherit from each of our parents, at several individual sites throughout our genome (like the single sites in chromosome 16 I mentioned in my video on ginger hair. They match all this information up and using the simple knowledge of how chromosomes swap chunks of DNA (recombination) during meiosis, to find the ancestry shared chunks of DNA lie. They called this ‘admixture’ – think of it as mixing the DNA in the same way as your features are mixed – I have my dad’s nose and my mum’s chin for example. Here, the chromosomes of individuals in a population may share ancestors with those in other populations, and this will result in shared “chunks” of DNA that you can trace to the population’s geographical region. Delving back through populations allows you to find more of the sources of those chunks and work out where (in time and location) they were mixed. Essentially the longer the shared chunk of DNA, the closer the ancestry, and they built their history from there. The figure below shows some of the findings. A rather complicated diagram of all the populations in the study. A, B and C show individual populations and how recently they have mixed with the donor population. 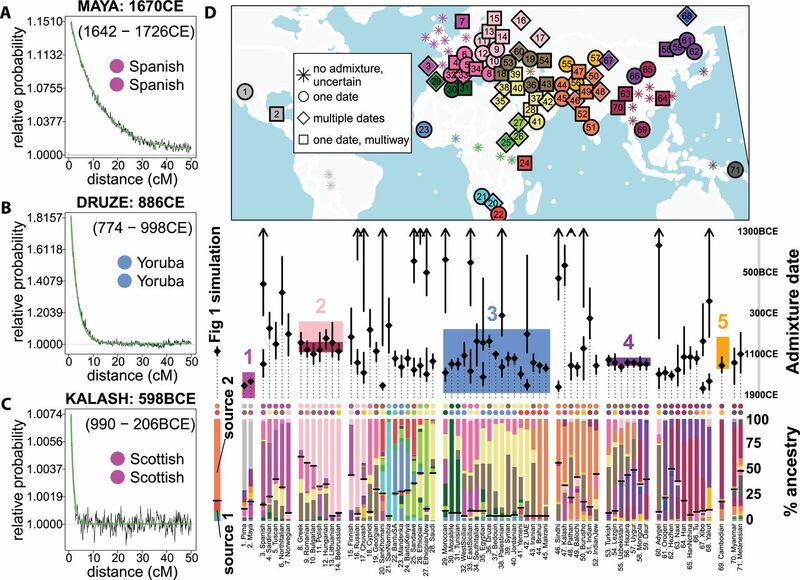 C shows that the admixture in the Kalash from the Western European population last occured around 598BCE. D shows the map of populations. Look at the bars at the bottom – they’re a colour code that represents shared ancestry. Striking is the amount of fuchsia (their word) (typically Spanish/European 3-7) in the Maya (1) and Inca (2) populations representing European colonisation of the Americas, the yellow that dominates the Middle Eastern populations (35 – 43) but is found in Tuscan (5), Greek (8) and even Ethiopian (26) populations, and the blue/cyan found in Bantu Africans (22-24) and in the Middle East (big blue box numbered “3”), representing the effect of the Arab slave trade. From: Hellenthal et al., 2014, A Genetic Atlas of Human Admixture History, Science. The African paper did much the same – noting how specific alleles and regions of DNA are inherited from generation to generation, and calculating the genetic mix between populations. Given today’s diverse distribution of African’s from all over the continent, surprisingly they find relatively little mixing. Ancient genetic populations are found in eastern Nigeria that haven’t seen a great deal of genetic mixing for over 6,500 years. Looking back in history, however, may tell you why. The most recent population movement and expansion across the region began around 5,000 years ago — the Bantu expansion. The history of the Bantu expansion is probably complex, but you can see from the vast numbers of Bantu languages, like the Chichewa, Chinyanja, Lomwe, Senga, Takwane and numerous others spoken in just the immediate vicinity of where I’m sitting, that the expansion was large. Studies like these can provide new insights into exactly how large and how complex. The paper proves that actually not a great deal of genetic mixing has happened since that great migration. African admixture showing Eurasion (turquoise), hunter gatherer (purple) and sub-Saharan African ancestry in populations accross Africa. Dates show the majority of the admixture in populations for Eurasian ancestry (left) and hunter gatherer ancestry (right). Note how ancient the population is in eastern Nigeria (Igbo and Yoruba) – most recent Eurasian mixture 7,500-10,500 years ago and hunter gatherer mixture 6,500-11,100 years ago. From: Gurdasani et al., 2014, The African Genome Variation Project shapes medical genetics in Africa, Nature. This is why these two stories are interesting to me. They’re our stories and they tell our histories. For Asians, this is how much the Mongol empire of Ghengis Khan has influenced their genetic makeup, as well as their culture, architecture and wider society. It’s for the Kalash people – an isolated population in the Hindu Kush, genetic evidence suggests may have last mixed with a Western Eurasian population in the time of Alexander the Great. It’s the San people – an ancient population in southern Africa whose hunter gatherer relatives have contributed to populations as far as West and East Africa. The research shows that those African populations also show ancient Eurasian ancestry, suggesting some early migration back to Africa soon after leaving the continent for new parts of the world. It also reveals that there may even be genetically distinct hunter gatherer populations in western Africa today. It also tells of more sinister events in human history. Like how historical evidence of the Arab slave trade matches West, East and southern African genetic traces throughout the ancient Mediterranean world, ancient Persia and Saudi Arabia. And how European merchants of the Silk Road may have mixed with local Chinese populations, evident in the modern day genetics of the Tu people of China. Genetic legacies like these reveal the good and the bad parts of our ancestry. I think it’s great that the researchers who have produced these papers have recognised these stories and kept them in their work. Some of the evidence for these events is stronger than others, some is still just legend, but I find it amazing that modern molecular biology and genetics can contribute to these fundamentally human life stories.